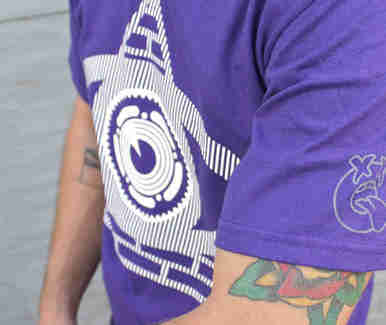 This line of colorfully-graphic'd bicycle-themed streetwear is the latest from a Seatown jack-of-all-trades (graphic designer/screen printer/blogger, etc) who decided to put his tee-making skills to use after the success of his prolifically updated blog dedicated to NW fixed gear enthusiasts and street riders, also what they call the parts of his family that Isiah clearly won't support. 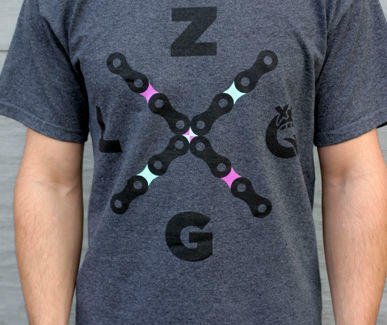 Zlog's brand-new summer drop boasts logo numbers like the heather gray X-Up with the brand's name placed around a crossed bike chain; Clouded, which depicts a cartoonishly gagging face almost completely obscured by dust; and the dollar-bill-inspired Illuminati, except the Eye of Providence atop the unfinished pyramid is replaced by a sprocket, which still can't get Doc to pay attention to the Fraggles traipsing through his workshop. Other styles range from a tank top printed with Ride Or Die (where the "O" is a bike wheel), to more understated styles including the black and white photo chested Drop Bars Not Bombs, and the asphalt gray Skid Allover that's subtly printed with tire tracks, and the inspiration behind Clint Dempsey's second single, Don't Tread on Tee. Future plans include a range of logo ball caps dropping this summer, new releases of hoodies/fleece/etc. for fall, and collaborating with a boutique Cali-frame maker on a new a new two-wheeler, which doesn't take a variety of skills for a Renaissance man to master, assuming he can reach the pedals.